Cortland, New York (March 20, 2019) – It’s easier than ever to make sure every technician in a shop receives training on the proper use of vehicle lifts. 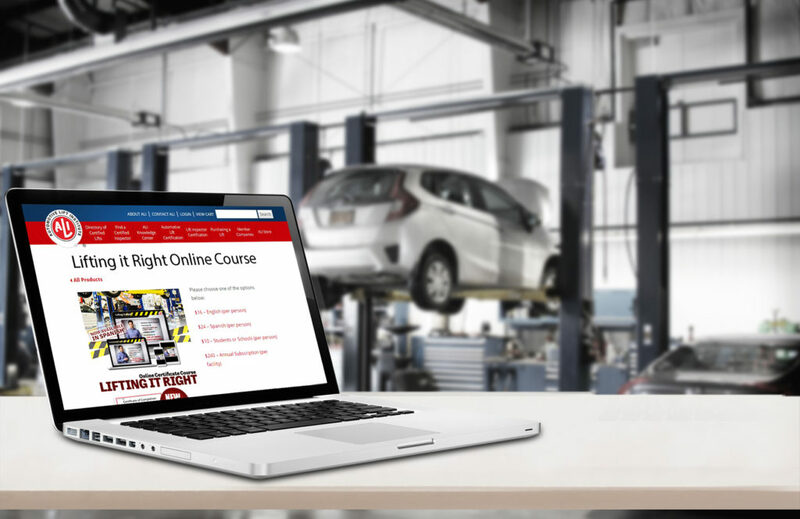 Automotive Lift Institute (ALI), is now offering an annual subscription option for it’s popular Lifting It Right online lift safety training course. An annual facility-wide subscription allows everyone in a single location to take the course as often as needed throughout the year. This option makes it easier for facilities to train new employees, provides a significant cost savings for larger organizations, and simplifies payment. Another new pricing option for the online course is a lower rate for vocational students or schools. An annual subscription is $240 per facility location. The new student rate is $10 per person. Standard pricing is $16 per participant for the English version of the course and $24 per participant for Spanish. Lifting It Right covers proper lifting practices for all types of vehicle lifts. The online course can be taken on a computer or mobile device. Most people finish it in an hour or less. At the end, a certificate of completion is stored online for easy access if a shop needs to produce training records. The course helps facilities comply with national and local safety training requirements. Lifting It Right is available to order at www.autolift.org/ali-store/. Once registered, the trainee can take up to 90 days to successfully complete the program, including an online test. For more information about ALI and its lift safety initiatives and materials, visit www.autolift.org or call (607) 756-7775. You can also connect with ALI on Facebook at www.facebook.com/LiftInstitute, on Twitter at www.twitter.com/LiftInstitute, and on YouTube at www.youtube.com/LiftInstitute. Founded in 1945, the Automotive Lift Institute (ALI) is a trade association of North American-based lift manufacturers. ALI’s mission is to promote the safe design, construction, installation, service, inspection and use of automotive lifts. In 1947, ALI developed the first Commercial Standard covering vehicle lifts published by the National Bureau of Standards. Today, ALI sponsors several national lift safety standards and offers third-party certification programs for automotive lifts and automotive lift inspectors. Editor’s Note: Please see attached image. Caption: The Automotive Lift Institute (ALI) now offers an annual subscription for facilities and special pricing for students and schools for its Lifting It Right online lift safety training course.